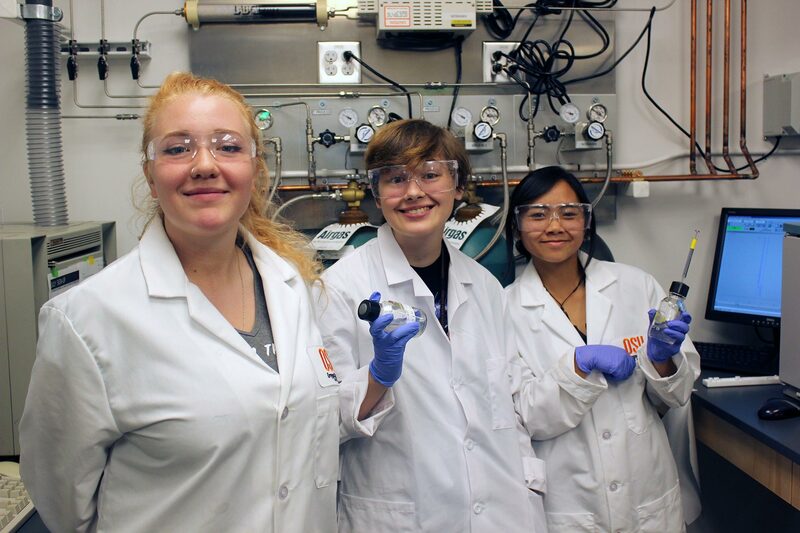 Each summer, Oregon State University hosts a one-week program called Summer Experience in Science and Engineering for Youth (SESEY). The program attracts high school girls and minority students with an aptitude for math and science, and helps motivate them to explore the world of engineering as an educational and career goal. Over the past 21 years, 920 talented teenagers have taken part in the SESEY program. During their week on campus in Corvallis, the students obtain an authentic college experience. They stay in residence halls, eat in dining centers, and use campus recreational facilities. They work in pairs on engineering projects in research laboratories with faculty and college student mentors, all of whom donate their time and resources to the program. The experience culminates with a poster presentation, where the students share what they have learned with students, mentors, parents, and friends. Amelia Muldrew, 17, a senior at Grant High School in Portland, worked in the laboratory of Christine Kelly, associate professor of bioengineering, with two undergraduate student mentors. Her project involved examining the potentially harmful effects of nitrate concentrations in pond water on Darlingtonia californica, a rare carnivorous plant found in Oregon. Her group collected samples from nearby Oak Creek and brought them back to the lab for analysis. If that sounds like a mouthful, keep in mind that the mouth from which it sprang hadn’t spoken the word “spectrophotometer” until earlier that week. And before that, Muldrew said, she hadn’t even considered a career in science or engineering. Now, she intends to apply to Oregon State. “This week was eye-opening,” she said. “It’s all due to the mentors. The mentors were amazing.” Enya Cochran, 17, a senior from Ashland High School, had a passion for science and math long before visiting Oregon State. For her, SESEY was an opportunity to spend some time with other students who share her interests, explore possible college majors, and check out what the campus has to offer. Enya’s group worked on a project in the laboratory of Lewis Semprini, distinguished professor of environmental engineering, examining the ability of anaerobic microbes to break down trichloroethylene, a persistent environmental contaminant. She said that the most exciting part of her week on campus was getting her hands on some scientific equipment in the lab. After participating in SESEY, Enya said she was impressed with Oregon State and plans to apply. She said that for now she is leaning toward chemical or environmental engineering. SESEY (Summer Experience in Science and Engineering for Youth) was created to encourage traditionally underrepresented groups to explore the world of engineering and to consider careers in its variety of fields. This one-week summer program is open to all who are interested in supporting that mission and who otherwise meet the application requirements. The program will culminate with a presentation of student projects and a display at the annual Corvallis da Vinci Days celebration.